Clark freely admits that he didn’t invent the dish, but his version is certainly the best one in the city. 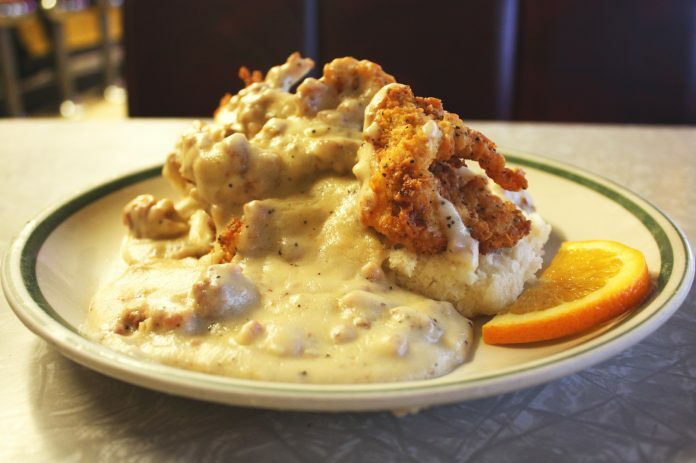 The freshly-baked, buttery, “true-southern” biscuits and made-to-order buttermilk brined chicken stand out, but it’s the rich, thick gravy that sets it apart. While “you could almost just eat the gravy as a meal,” he made sure that it didn’t overwhelm everything else. Clark wouldn’t dream of taking the dish off the menu now, but when he first opened in 2010, it didn’t even make the initial draft. “It was something the staff would eat because it was quick and easy,” Clark says. Sometime around the end of 2011, he decided to add it on.“I thought the kitchen was going to walk out. Every single ticket had the comfy on it. It was ridiculous,” Clark says. The kitchen served more than 200 biscuits that day. It’s been on the menu ever since.